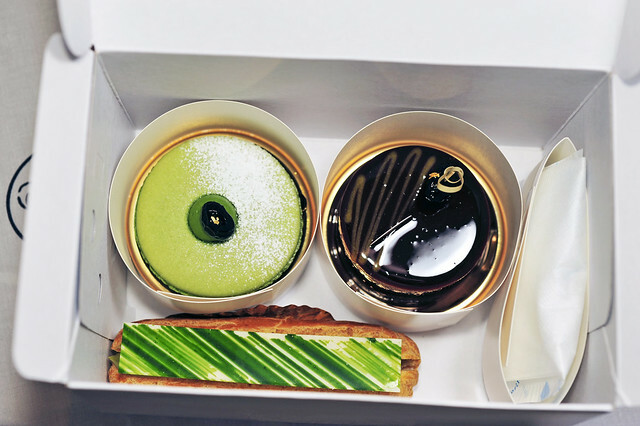 As we were on our way, leaving Gion to cross Kamogawa for Takashimaya Kyoto, we chanced upon our first french pastry shop in Kyoto, Pâtisserie Gion Sakai. Amidst the traditional Japanese architectural infrastructure of this part of the ancient city which beared two-storey shophouses with wooden framed doors, this establishment seemed like the most unexpecting and perhaps awkward juxtaposition. Nonetheless, we are glad that we have found it. Nested within a row of two-storey shophouses, the lower floor displayed a whole range of products they offer from petits gâteaux to petit fours sec and other mignardises like assortment of candy and chocolates. The upper floor is a dine-in area. We were quite hungry and tired after a whole day of walking but honestly speaking, à la impromptu, were not in the mood for a leisure tea session. But we couldn’t resist taking away something with us and indeed we did! And this is what it looked like inside. Each piece individually cordoned off from the others with cardboard and there’s an ice-pack on the right, despite the freezing temperatures outside. yasashii ne! 宇治抹茶のマカロン丹波黑豆仕立て Uji mtacha macaron with Tanba black beans. 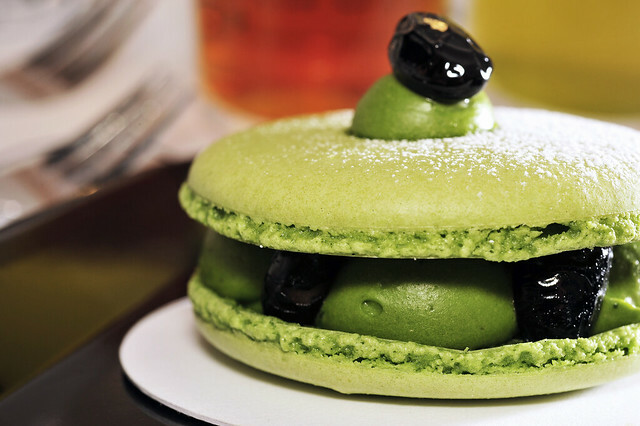 8-cm wide macaron shells (think Ispahan) with dollops of creamy Japanese green tea cream, embellished with candied black beans. 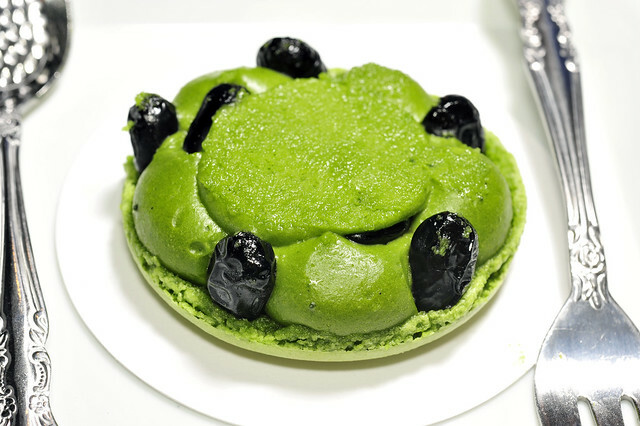 A classic example of Japanese-inspired French pastry making, a somewhat fusion piece. The Japanese patissiers were the earliest to bring the art of western pastry making to the eastern hemisphere. 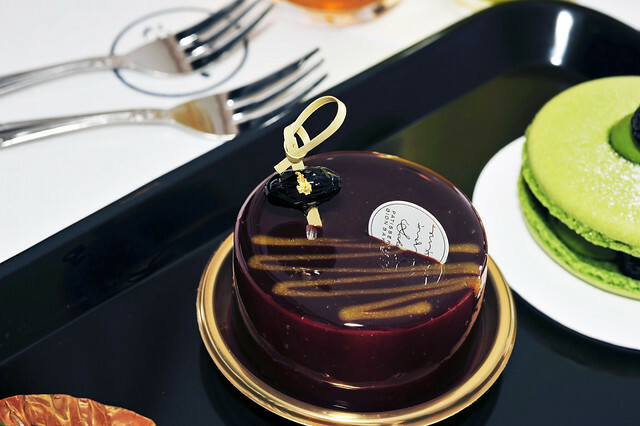 Since then, many Japanese patissiers have attempted to infuse their familiar local flavours, many of which are wagashi 和菓子 ingredients and techniques into the french art. 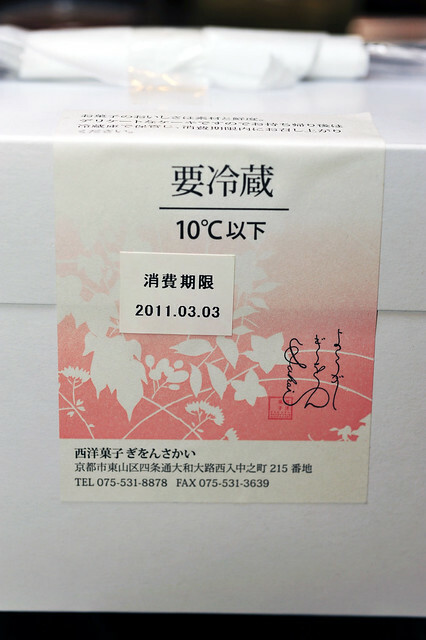 Matcha, azuki, kurogoma, kinako and most lately, even sansho the common items on the list. Removing the top shell revealed somewhat excessive amount of matcha cream. The perimeters were lined with candied black beans from the Tamba region adjacent to Western Kyoto and the Japanese people love them, much like how the Italians and the French revered marron glacé ! Slicing the piece revealing the characteristic yellow of Tamba black beans. The regular ones we use for soup comes from China and have greenish innards. The inclusion of Tamba blackbeans was an interesting gesture and definitely adds dimension to the piece. But on the whole, we still felt that the macaron lacked character and tasted somewhat flat. Perhaps ithe copious quantities of matcha cream was too overwhelming and became burdensome to the palate. Perhaps the cream wasn’t light enough. 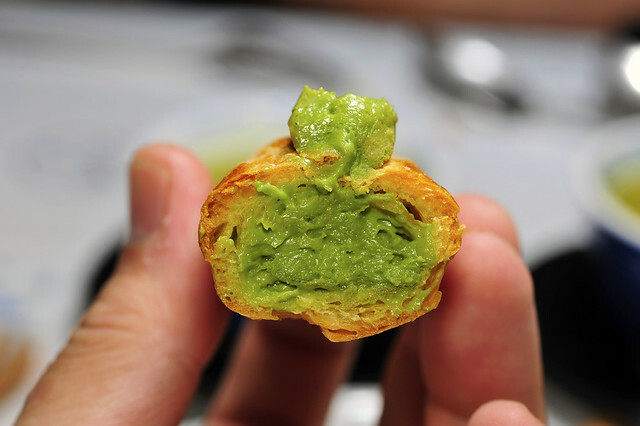 While we totally empathise with the notion of an almost “zen-like” simplicity by keeping the components down to a minimal few, at the same time we seek to be enthralled with a slightly more multi-facade piece, perhaps a blob of cooked azuki bean paste under the central dollop of macha cream for the surprise element? Would that mess up the flavours the creator had intended? Life’s so full of “what ifs”. The presentation was very stunning. 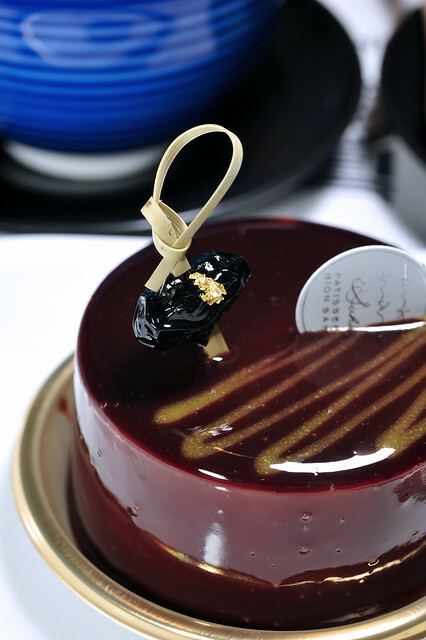 A dark velvety reddish-brown hue with streaks of metallic gold lustre sealed in a glossy glaçage neutre with a Tamba black bean flecked with paillettes d’or veritable (edible gold flakes) impaled by an artistically contorted bamboo strip. The very first idea that came to my mind when I set my eyes of this piece was an exquisitely crafted shikki 漆器, a heavily lacquered wooden Japanese jewellery box with a hairpin resting on it.The piece was rotated several times round, catching the light to look for a good angle for a shoot while admiring it at the same time. Glossy objects can be such a photographic nightmare, especially with flash. These were the best I could conjure. 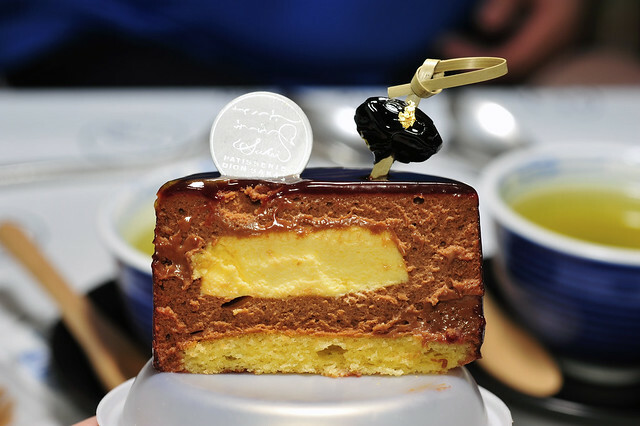 Some day surgery to reveal the innards – joconde sponge base with dark chocolate mousse encasing a yuzu cream heart and finally covered with first a chocolate glace and then neutral glace. The chocolate mousse was really dark and bitter, using at least 70% cocoa. Think along the lines of Guanaja or Aruagani. And this was remarkably contrasted by the acrid yuzu within. The yuzu mousse was really very very sour. And for a citrus lover like me, you’d better take my word for it! Its just like drinking 100% yuzu juice (been there done that!) as the creator’s obvious intentions were to accentuate this taste and made no attempts whatsoever to milden it. And I’m glad it was done so with much deliberation as any means to sweeten the cream as a form of euphemism to the acridity would really do the yuzu grave injustice. I love the “if you have it, flaunt it” attitude this mousse seems to carry. The first mouthful was indeed shocking but we grew to enjoy it. Alas it was too small to be enjoyed sufficiently by two so yes, we would definitely look forward to trying it again if we have a chance to visit Kyoto. 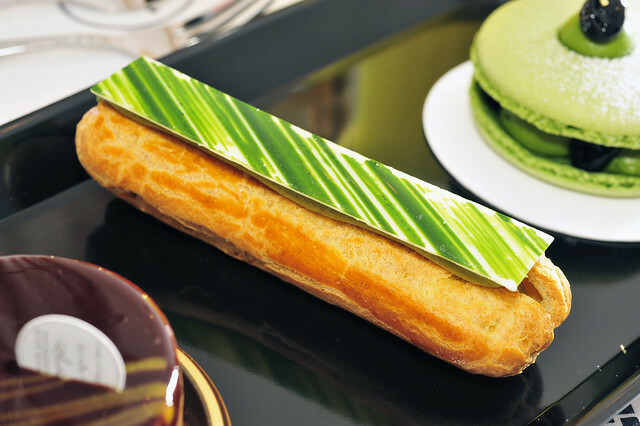 One last piece was an éclair au thé Matcha. Call me superficial but what attracted me to this was the slab of tempered chocolat blanc with green streaks dredged across. 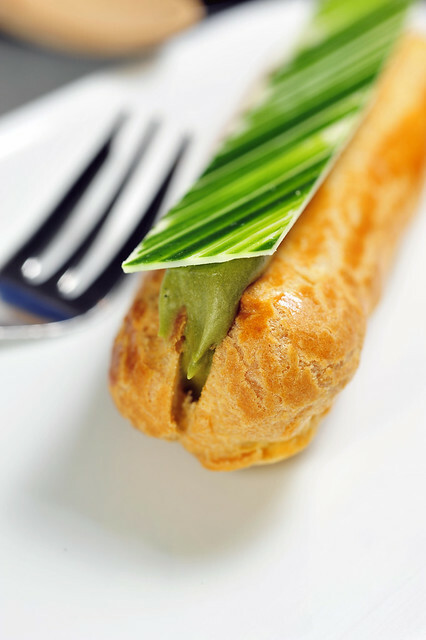 As for the pâte à choux, we’ll have to try it to know it yeah? Peekaboo of the matcha custard cream within. Removing the white chocolate slab. White chocolate is a good carrier of flavours, and in this case, matcha in the custard. Slight hint of bitterness went well the sweetness of the chocolate, not to mention the crunch and textures as one bit into the cigar-length piece. The tempered white chocolate oblong should not be merely regarded as a decor but an integrated part of the conception and should be consumed together with the rest of the pastry. Its quite drab on its own with just choux pastry and custard cream. 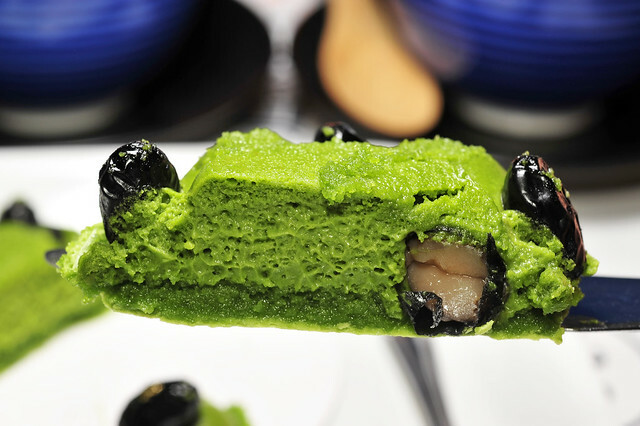 Aoki used a matcha fondant patisserie glacage for his rendition and for Gion-Sakai’s, they’d used white chocolate. Some might not find this agreeable but the effort is certainly commendable. So yes, be sure to check out this place if you happen to be in Kyoto. Don’t be like us who opted for takeaways. Spend 1-2 hours in the dine-in section upstairs with a window seat and people watch. Good food needs to be tied in with good ambience. This entry was posted on June 1, 2011 by Alan (travellingfoodies). 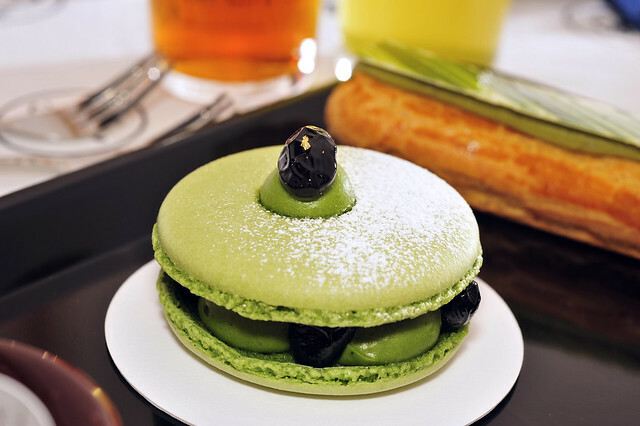 It was filed under Food, Travel and was tagged with choux, Eclair au The Vert Matcha, Japan, japanese green tea, kansai, Kyoto, Macaron Matcha, Mousse au Chocolat et Yuzu, pastry, Patisserie Gion Sakai, petit four, Shijo, 日本, 京都. Looking at your post. I wish I wish I pray that one day I can visit Japan. hi Edith, I wish I could go back to Japan soon too. Its such a lovely place, the scenery, the people and the food! One more question, Alan- did you use flash for these photos? Hi Shirley! That would be a smashing idea. Keep us posted on your escapades in Japan! Actually, I didn’t enjoy the macaron has I had thought I would. Its too plain for me. A good way to balance the sweetness of macaron shells would be with a sharp and sourish filling IMHO. I admire all your post on Japan, it’s awesome and very impressive. I trust things will get better for Japan because their commitment to their way of life is just out of this world! Thanks Chef Gregoire, I hope Japan would “recover” soon too. But the Japanese is a race known for their strength, undoubtedly they would be back on their feet soon. 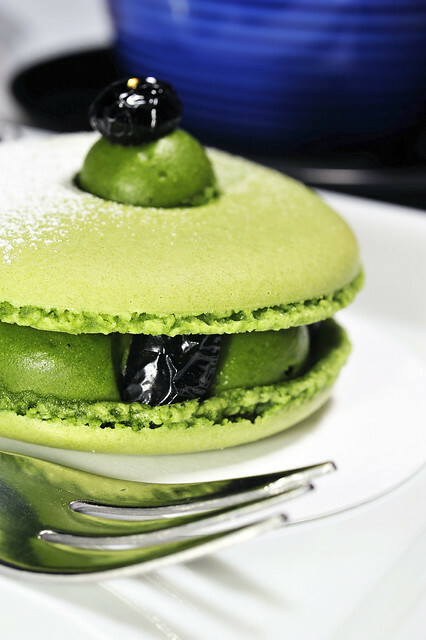 hello alan, i think too that the matcha cream was a little bit too much for the macaron. Hey, your ispahan looks much more tempting than this one! BUt i like the yuzu mousse cake. 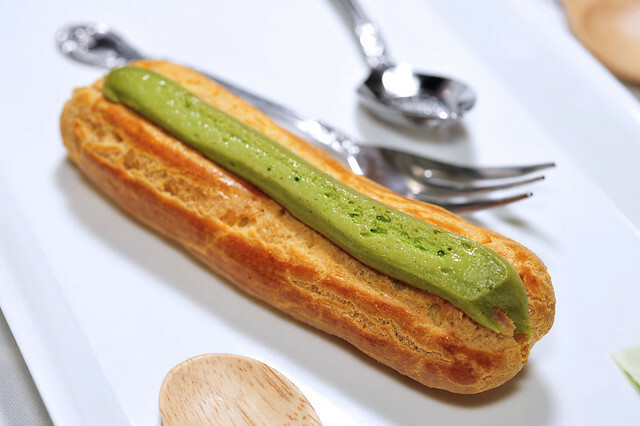 The eclair is not bad in the picture especially with that piece of choc on top, looks very attractive! i wanted to tell you this also, i was on a trip to hkg last week and i came across the sakura mochi, the one with the sakura leaves which i saw on the blog and i was thinking, eh, i must go and tell alan abt this when i get back! Although i didnt get to taste the ones from japan, i was glad that i saw it in one of the malls selling this and i cldnt wait to get a piece of that and yes, eat the leaves as well since you said the leaves are edible. Quite nice, the leaf actually gives a very nice aroma to the mochi! Hi Lena! Welcome back from Hong Kong! the yuzu chocolate mousse is quite well balanced and somewhat challenges one’s tolerance for extremities in taste! The leaves are exude a rather pleasant aroma yes. Hope you’d liked it. haha. Interesting they still have it now considering the hanami season is way over (i think). I hope to make some soon with ingredients i got back from Osaka! alan, you want to make those sakura mochi? wow, cant wait to see that post!! haha i shall try! bought ingredients from my last osaka trip but too lazy to get it done! Alan, I shouldn’t have come here at this hour. What a torture to see all the yummy food and can’t taste them unless I jump on the plane to fly to Japan. The only solution now is to crawl onto my bed and start dreaming that I am in Patiserrie Gion Sakai, Kyoto, sitting upstairs near the window enjoying good food and people watching. I wish I could spend 6 hours not 2.
haha Veronica, you are so funny! And I meant it in a good way! but yes, i’ll love to visit Kyoto again if I have a chance. That place is so full of history and beauty. Such a sharp contrast to metropolitan cities like tokyo and osaka.